If you want the auto, get the auto. The 9015 is a solid movement. Too many times I've settled and regretted. Buy once, cry once. That personal dilemma follows me to tools also. The lathe I want, and the lathe that's in my budget. Damn my middle class life! Anyone heard from Subterfuge/Artifice/Alex as of late? If so is he back catching up on his work? Haven't heard from him in a long time. The one he did for me though is one of my favorites. SKX007, Sumo dial, MM hands. I heard from him a while back and haven’t had any comms returned in months. Why I bought this was I was a bit mad about needing to pay that much for not buying sooner.. 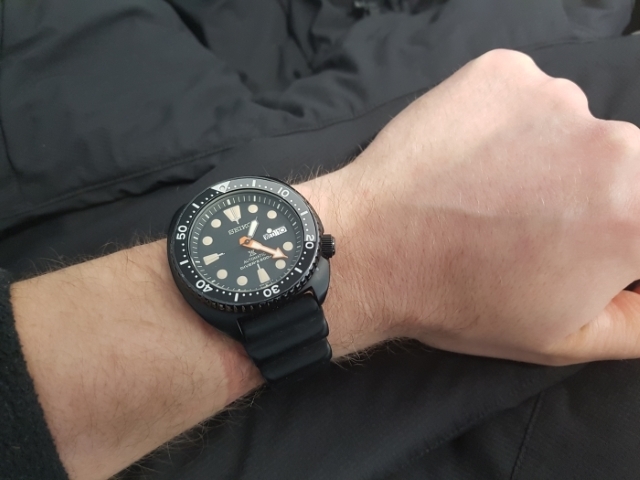 The black Turtle looks a lot nicer in your pic than the Seiko pics! Anyway, both Seiko and Citizen have some interesting offerings coming up. Since my watch “thing” started around 1986 when I bought my “Baby Arnie” I have wanted a real Arnie even after buying a 6309 sometime in 1989 after TACP tech school. Citizen has a 30th Anniversary Aqualand model coming out which I think looks a lot better than some of the follow ons to the 1989 model [same story, didn’t buy an original Aqualand in the 80s and lusted after one since]. To go back a bit, I had a bunk bed where I slept as a kid during some years and this poster was plastered on my roof.. I'm really liking that Citizen! I gotta post this pic. Late 80s vintage Arnie and Aqualand. My first loves missed on watches.